HER FINAL BREATH begins with a dedication to members of law enforcement thanking them for their efforts. This is timely and vital considering all of the anti-police sentiment of recent years. Within the book’s pages, author Robert Dugoni depicts a wide range of law enforcement figures, not all of whom see eye to eye. The fact that people who should be on the same side appear to be at cross-purposes with each other highlights the political nature of that vocation and shows how similar it is to any other profession. This novel, featuring a brutal serial killer as its core element, is a chill-inducing potboiler of a story that builds tension to an almost unbearable level. Our heroine is Seattle homicide detective Tracy Crosswhite, who leads a highly capable team of skilled professionals who will be pushed to the limit in pursuit of the deadly serial killer nicknamed the Cowboy. "Dugoni does a masterful job with this entertaining novel, as he has done in all his prior works. If you are not already reading his books, you should be! HER FINAL BREATH is a great place to start." It starts with Tracy being taunted by the killer. When local strippers and exotic dancers turn up strangled in creative ways, the Cowboy goes out of his way to let Tracy know that he is out there and well aware of who she is. Initially, he does this by leaving a noose hanging near a shooting range where Tracy is at. Unfortunately for Tracy, this will be the most benign message that will be left for her. The pursuit of the Cowboy takes an interesting twist when Tracy and her colleagues --- along with an FBI profiler --- recognize that the series of murders resembles some from a decade earlier. The only problem is that someone was already convicted and jailed for that. Could an innocent man be in prison while the real killer picks up where he left off? That question spurs on Tracy and the team, and puts them directly in the crosshairs of Johnny Nolasco, the detective responsible for catching the original killer. Nolasco is not at all pleased that his police work is coming under scrutiny, and he has designs on doing what he can to be a thorn in Tracy's side. This schism within Seattle law enforcement is unhealthy and ultimately will open the door for the actual killer to continue his deadly spree. Profiler Santos surmises that the Cowboy is killing as part of a ritual that may have begun in his own childhood. 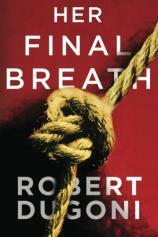 HER FINAL BREATH acts equally as a mystery story as there are a series of potential suspects, and the reader will find it difficult to decide who the guilty party is. You find yourself rooting hard for Tracy --- even as she does battle with her own department --- yet it is impossible not to feel equally scared for her as she has no idea of the danger she is in. Dugoni does a masterful job with this entertaining novel, as he has done in all his prior works. If you are not already reading his books, you should be! HER FINAL BREATH is a great place to start.